The college football season is over, but not the College Football Report. There is much to talk about, at least enough for a few weeks of wrap-up. This week, we offer our obligatory analysis of the one-sided affair that was the BCS National Championship Game. Outclassed. Outgunned. Overmatched. Overwhelmed. Notre Dame was out- and over-everythinged. Despite what Steve Spurrier would have you believe, the Crimson Tide couldn't compete in the NFL. But against Notre Dame, 'Bama looked like a Super Bowl contender. In what was the final nail of the coffin for the BCS system, the #1 Irish took a 42-14 drubbing from #2 Alabama. The vaunted Irish defense repeatedly failed to bring down 'Bama junior RB Eddie Lacy (140 yards, 1 TD) and freshman T.J. Yeldon (108 yards, 1 TD), and overall Alabama averaged an absurd 5.9 yards per rush. Highlights of the game feature Lacy shedding ND defenders on runs of 17 (x2) and 20 (x2) yards. Maybe the Irish can blame those special Adidas gloves and cleats cleats for the game, though we suspect the Domers could have been wearing Stick'Em and it wouldn't have mattered. 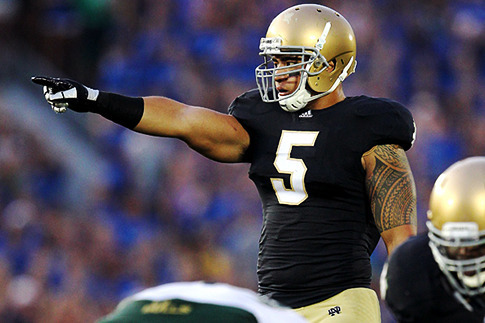 Even Manti Te'o, Heisman runner-up and heroic face of the Irish "D," missed a number of tackles, leading analysts to believe that the game badly exposed his two major weaknesses - tackling and speed - and may have dropped him out of the first round in April's NFL draft. But his tattoo is still super awesome, so there's that. In other silver-lining news for the Fighting Irish, a BCS computer named the Colley Matrix, a second cousin of the 1951 Wolverhampton Instrument for Teaching Computing from Harwell (WITCH), still has Notre Dame ranked #1. When ABC scanned the crowd during a break in the action in the first quarter, the camera settled on Katherine Webb, former Miss Alabama and main squeeze of 'Bama QB McCarron. Play-by-play man Brent Musburger worked himself into a lather pointing out the "lovely lady" in the stands, and how fortunate 'Bama QBs are "to get all the good-lookin' women . . . " For emphasis he added, "What a beautiful woman, wow! Woah!" But our favorite part has to be his passing mention of McCarron's mom, standing to Webb's left. Brent should have skipped the post-game apology and sent Dee Dee some flowers instead. Note that this is not the first time Musburger has spotted some off-the-field talent. During a shot of the sidelines in a 2005 game between Florida State and Miami, Musburger called out a group of Seminoles coeds, notably the bikini-clad Jenn Sterger, who vaulted into instant B-list celebrity status. Similar to Sterger, Webb has capitalized on the opportunity, landing a swimsuit shoot (maybe) for Sports Illustrated, job offers from Donald Trump and softballs from Matt Lauer. But There's Always Next Year, Right? Coach? A week ago, the future looked bright for ND. The team was in the championship and coach Brian Kelly had landed the top recruiting class for next year. Now the program is fresh off an embarrassment in prime time and Kelly is flirting with the NFL. Even the recruits are looking for the nearest exit: Alex Anzalone, a Top 150 player, flipped to Florida at the last minute on Thursday, bumping the Gators up to the top spot. Popular opinion holds that Kelly should stay in South Bend and build a legacy. Others argue that his dalliance with the Philadelphia Eagles is a feint to squeeze more cash out of ND. But Kelly may not care to stay in South Bend for any amount. We agree with CBS columnist Dennis Dodd: Kelly may realize he has taken the Irish about as far as possible, and his stock may never be higher. Who are we to judge? Kelly has progressed from an assistant (1987-90) and then head coach (1991-2003) for the Grand Valley State Lakers in Division II, followed by Central Michigan (2004-06), and Cincinnati (2007-09). Now, after three seasons (8-5, 8-5, and 12-1), three bowls (1-2), and one BCS appearance (and we're using the word "appearance" generously), with Notre Dame, Kelly has seen the future . . . and the future is the SEC. High above Touchdown Jesus, the vultures are already circling, although why any top coaching prospect would want to deal with all of the Irish baggage at this point is beyond us. Finally, our thoughts go out to the Crimson Tide student who was severely injured in when his pickup crashed into the Alabama cheerleaders' bus en route to Tuscaloosa.